Sheep breeding season started on September this year and will last for 37 days. This is a month earlier than we started last year, which was earlier than we started the year before. It means, of course, that lambing season will also begin a lot earlier than usual, in (yikes) late January. It's an experiment. We currently have two rams, Da Big Guy (born in the 'D' name year) and The Kid (aka Hey Kid; yep, that's his 'H' name). For 328 days a year these two guys live together, separate from the rest of the flock, and get along just fine. When it's cold they even snuggle. Add in some girls to fight over, though, and things would get really ugly. So when we're breeding, the rams are each locked up with their own ewes, and the two mini flocks are kept apart from each other, never even sharing a fence. This set up keeps the peace and makes everybody happy. But it can't hurt to have a little look every once in a while, can it? 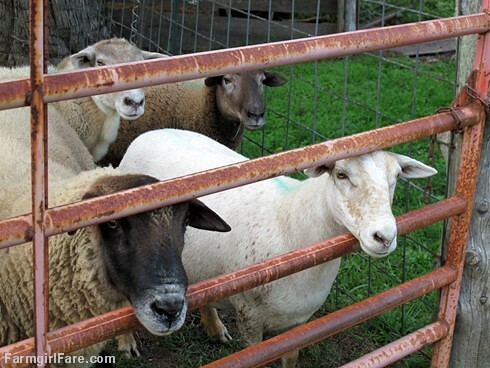 After all, you know what they say—the sheep are always cuter on the other side of the fence. Lots of cute little lambs? Here. 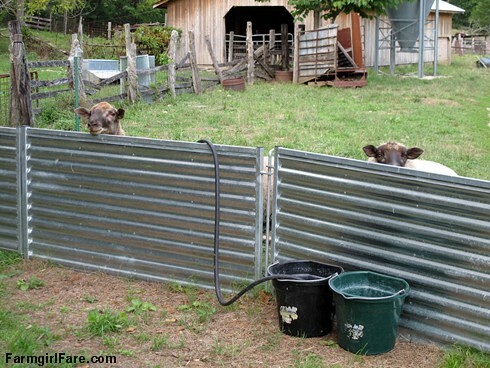 © FarmgirlFare.com, where, okay, in the last two photos they're actually checking out the incoming treat bucket. Are you doing this experiment because of the changing weather patterns and it being warmer earlier in the year? Love following your Farmgirl blog. Actually we're doing it for financial reasons. Lamb prices at the sale barn usually drop after Easter, but our lambs are never big enough to sell by then. We never used to worry about it because we didn't sell lambs in early spring, but this year we had a grand new plan, and even though we started lambing in late February (our earliest ever), the prices still dropped by 40% from the April livestock sale to the one in May where we sold our sheep. That hurt. A lot. So you'll be lambing in the...snow? Yikes. Time to load up the lambing "condo" with lots of blankets. And maybe some bourbon. Just saying. I will be interested in hearing how you like January lambs. Been there, done that, no more. It was one of the coldest Januarys on record. In all honesty the sheep/lambs did fine. I just don't like cold weather. I much prefer spring lambs. For several reasons, we cut way back this year and are only breeding 11 ewes, so we figured it would be a good time to try the early lambing. With that few pregnant ewes, we can at least lock them in the barn each night, so nobody will be having babies out in the freezing barnyard. Love the solid panel gates, I haven't seen that kind before. Do sheep rams get stinky like goat bucks? Those solid panels are actually part of the sheep handling equipment we invested in a few years ago in an attempt to organize/streamline our sheep operation. You can see more of how the set up works here. 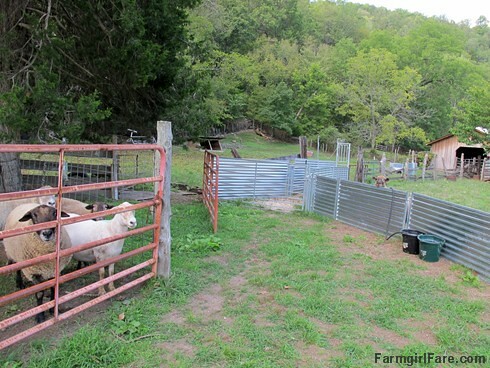 In this case, the panels are doing double duty as a temporary fence, keeping The Kid and his girls locked in part of the driveway next to the barn. The grass is finally starting to come back, but there still isn't much, and with three separate flocks right now because of breeding, we're putting sheep in every green spot we can - including in the road!